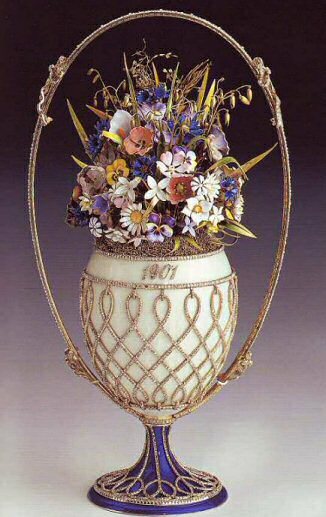 The 1901 Flower Basket Egg, also known as Basket of Wild Flowers Egg, is made of silver, parcel-gilt, opalescent oyster and (later) dark blue enamel, rose-cut diamonds, green gold, and opaque multicolored enamels for the flowers. 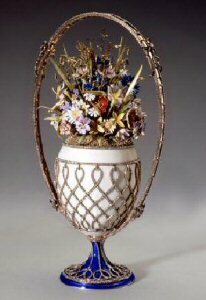 In the form of a flower basket, this silver Egg's body is covered with opalescent oyster enamel and applied with a trellis-work in rose-cut diamonds. 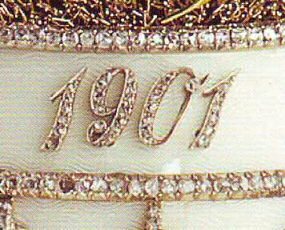 The date, 1901, is also in rose-cut diamonds. The foot of this egg is now dark blue enamel. A beautiful composition of wildflowers sits in green gold thread moss. 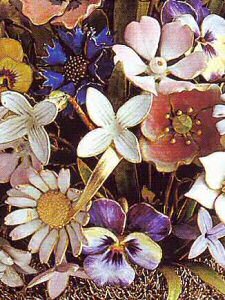 The flowers are made of gold and are covered with a variety of colors of enamel, including pink, white, dark-blue, orange and mauve. The basket is finished with a diamond-set handle. An old photograph (1902) exists on which the entire body of this Egg was white enamel. It is assumed that the foot was restored after the Russian Revolution and changed from white to dark-blue. It is not known if there was a surprise with this Egg. 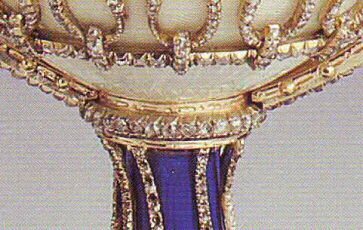 The original Fabergé invoice mentions "pearls" and since there are no pearls on the Egg, they probably were connected to the surprise. A broche or a string of pearls perhaps in some way attached to the Egg? In 1933 the Basket of Flowers Egg was sold by the Antikvariat to an unrecorded buyer, probably Emanuel Snowman of Wartski, or Michel Norman of the Australian Pearl Company. In 1933 acquired by Queen Mary, UK. 1953 inherited by Queen Elizabeth II, UK.